Decks are a great way to create additional entertaining space and boost sales appeal for your home. Add one anywhere--off the living room, dining room, or kitchen, beside the front entry, even off second story rooms. Rip out that old splintering wood deck or crumbling concrete pad and create a party space, a quiet retreat, or a "green" alternative to water-guzzling lawns. You might also choose to provide space for a tomato plant or flowers off a sunny upstairs den. 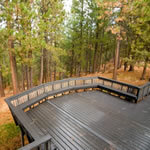 Your new deck can be made from weather resistant composite decking like Trex, from redwood, or a combination of those plus ornamental concrete, tile, brick, stucco, built-in planters and seats, and more. Let our vast library of articles and images hep you narrow down style and design options within your budget. You can also be connected to local experts who can help with the process, from design to construction. Start exploring here now to make your new deck a reality.